I gotta say I was impressed with the Ritz-Carlton in Key Biscayne. I was invited to try out their Dune Oceanfront Burger Lounge and on the way to the lounge, we took the scenic route around the place. The Dune is located on the north side of the property and close enough to the ocean to experience an awesome breeze (which we did). Plus, there was what I’ll call vacation music playing in the background which added a good touch to the atmosphere. There is a Kobe Beef Burger with Foie Gras & Grape Jam but I didn’t have it. I just wanted to make you aware of its existence, lol. I had the Oregonzola Burger (thick bacon and blue cheese froth) with fries. I saw a Combo Platter on the menu with a hot dog & slider and decided, sure why not? The burger came first but let’s talk about the platter. The dog was an all-beef hot dog which I topped with some Grey Poupon. I thought it was great and had to rush through because I had a couple of sliders to get to. 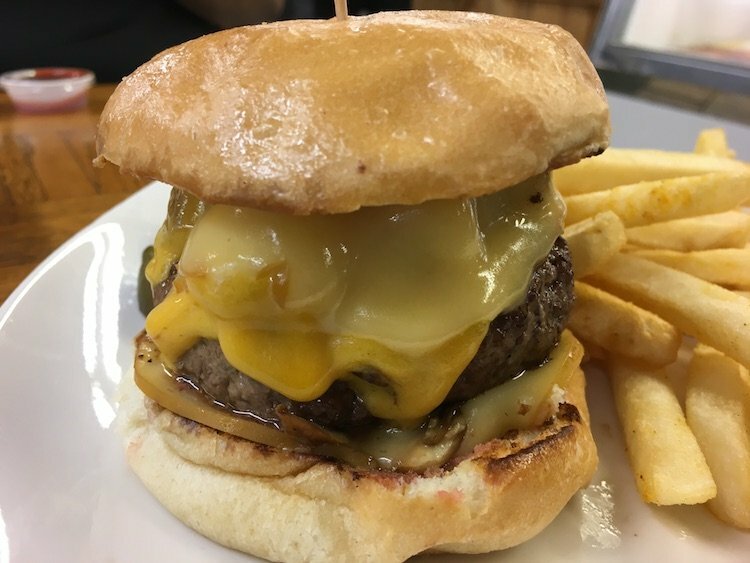 The first of the sliders was topped with cheddar cheese and was just a smaller version of their larger burger, maybe a tad bit juicier. The 2nd slider was a mini organic turkey burger topped with mushrooms and brie. Yes, there’s lettuce and tomato in the picture but I removed those guys. As a whole, I thought the flavors worked well but I’m not sure I would just order a plain turkey burger here. The brie and mushrooms really brought something to it. The fries, while crispy, I didn’t really care for. Let’s get to the main event. Wow. Just take a look at it. This burger was so damn good, as I write this my mouth waters. Great choice of toasted bun, the blue cheese froth, the thick bacon and the meat itself was all excellent. Here I am a few days later and I can’t get over how delicious it was. And that bacon with its smokiness…..I wanted to run into the kitchen and stuff my pockets with it, no joke. With the weather cooling down at last in Miami, now’s a good time to come check out the Dune. I want to thank the Ritz-Carlton for the invitation and when you check out this burger, I ask one thing. Please save some bacon for me.